A&E FEBRUARY 2018 • a-e-mag.com 17 • You can create very thin lines that may not show well using a conven- tional raster job. • It may save you some time. • You can forgo the use of laser marking materials in some cases. • It will allow you to work with mate- rial that cannot otherwise be marked well or efficiently using a raster job. VECTOR ENHANCEMENT Raster work looks pretty good on most materials, leaving sharp, defined edges. On some materials, particularly rough, natural materials, the edges of text and graphics can look frayed or out of focus. Giving your images a hairline outline via a vector job can enhance and define those edges for a better result. Vector enhancement is done using a high speed, low power vector job. Power should be set high enough to make a mark, yet low enough so as not to cut through the material you are working on. Frequency settings, with the idea being to mark a solid line, should be high enough to avoid making dashed lines. Frequency does not have to be set to the maximum. Your goal is not to vaporize the material, just create a burn mark. This technique is especially suited to rough material where a conventional raster job doesn't create defined edges, like rocks and rough-grained softwoods. It is particularly effective on rough natural fabrics and materials such as those found in welcome mats. The main thing to remember is to keep the vector job power high enough to make a mark, yet low enough so that it does not cut through the material. VECTOR SUBSTITUTION You can use a vector job in lieu of a raster job for items that have a lot of small lines, like the tick marks on measuring devices. I make a cast acrylic, half-scale carpenter square that includes a lot of tick marks. Running a raster job with thin lines works well if all of the lines are horizontal. Thin vertical lines, however, can be a problem. Depending on the line width of the drawing and the resolution of the print job, they may not even show up at all using a raster job. Running thin lines as vector hairlines assures you that a mark will be made regardless of the orientation of the lines. It's just a matter of drawing with hairlines and making your settings so that the lines are marked and do not cut all of the way through. For the carpenter square, I use color mapping to define the engraved hairlines and separate them from the hairlines used to cut the shape of the ruler. The carpenter square can be done as an all raster job (except for the cutting) or an all vector job. It turns out that a com- bination of a raster job for the numbers and contact information, and vector jobs for the tick marks and cutting the shape, gives the best results. VECTOR METAL MARKING Having a CO 2 laser usually means that directly marking metals without the use of some type of laser marking material is dif- ficult, if not impossible, to do. 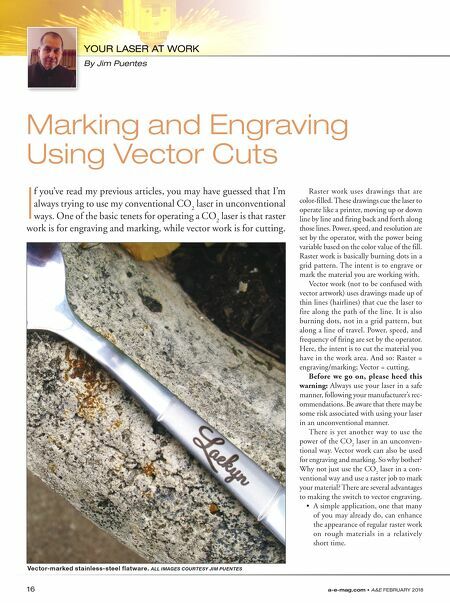 But you can make an acceptable mark with a CO 2 laser using a vector job. (Editor's note: Products such as CerMark and Thermark have been around for over 20 years and the process of using them is simple and well documented as being successful. Successfully marking on bare metal—with no marking compound—totally depends on the metal. Please also note safety regulations when using your laser in this manner.) 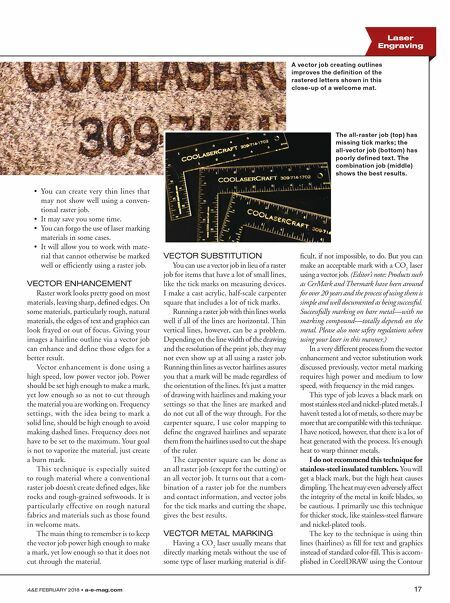 In a very different process from the vector enhancement and vector substitution work discussed previously, vector metal marking requires high power and medium to low speed, with frequency in the mid ranges. This type of job leaves a black mark on most stainless steel and nickel-plated metals. I haven't tested a lot of metals, so there may be more that are compatible with this technique. I have noticed, however, that there is a lot of heat generated with the process. It's enough heat to warp thinner metals. I do not recommend this technique for stainless-steel insulated tumblers. You will get a black mark, but the high heat causes dimpling. The heat may even adversely affect the integrity of the metal in knife blades, so be cautious. I primarily use this technique for thicker stock, like stainless-steel flatware and nickel-plated tools. The key to the technique is using thin lines (hairlines) as fill for text and graphics instead of standard color-fill. This is accom- plished in CorelDRAW using the Contour Laser Engraving A vector job creating outlines improves the definition of the rastered letters shown in this close-up of a welcome mat. The all-raster job (top) has missing tick marks; the all-vector job (bottom) has poorly defined text. The combination job (middle) shows the best results.